Traditionally, every week we bring you a list of the top former Buccaneers players who continue their career in pro basketball. #1. Trayvion Leonard (6'9''-F-93, graduated '16, plays pro in Chile) led CD Castro to a victory over the fourth-ranked Puente Alto (13-15) crushing them 89-66 in the Chilean Liga Nacional last Saturday. He was MVP of the game. Leonard had a double-double by scoring 43 points and getting 14 rebounds in 35 minutes; quite an impressive performance considering it's only his third season in pro basketball. Club Deportes Castro (1-1) is placed third in Conferencia Sur. Leonard's team will play only one more game in the Regular Season. And that game will be critical. Leonard has individually a very good year with high stats. He averages 17.5ppg, 10.5rpg and 1.7apg in 26 games he played so far. #2. Elvar Fridriksson (5'11''-PG-94, graduated '18, plays in Iceland) was the main contributor in Njardvik's victory against the fifth-ranked KR (11-7) 71-55 in the Icelandic Dominos League on Monday night. He was MVP of the game. Fridriksson scored 25 points, made 3 passes and 3 steals; not bad, considering it's only his first season in pro basketball. UMFN Njardvik (15-3) is placed first in the Dominos League. There are only four games left until the end of the Regular Season. So now every game is very crucial. This season Fridriksson has very high stats. He averages 23.2ppg, 6.2rpg, 4.8apg and 1.6spg. #3. Yunio Barrueta (6'4''-F/G-93, graduated '16, currently in France) was the major contributor in a Sluc Nancy Basket Pro's victory against the league leader Chorale de Roanne (14-4) 86-70 in the French ProB (second division) in Saturday night's game. Barrueta scored 20 points and grabbed 4 rebounds in 29 minutes. It was the game of the round between two top 4 ranked teams. Sluc Nancy Basket Pro (13-5) is placed second in the ProB. It was his team's sixth consecutive victory in a row. Barrueta has relatively good stats this year 11.1ppg and 3.9rpg in 17 games. He is a naturalized Cuban. #4. Juan Ferrales (6'2''-G-91, graduated '15, plays pro in Norway) contributed to an easy victory against one of league's weakest teams Nidaros Jets (4-18) crushing them 110-90 in the Norwegian BLNO last Saturday. He recorded a double-double by scoring 20 points and making 10 passes. Ferrales also added 6 rebounds and 5 steals. Kongsberg Miners (20-3) is placed first in the BLNO. There are only four games left until the end of the Regular Season. So now every game will be important. Ferrales has relatively good stats this season 13.8ppg, 3.8rpg, 5.4apg and 2.0spg. He is a naturalized Cuban. #5. 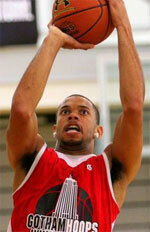 Theo Turner (7'0''-C-93, graduated '12, plays in Germany) could not help Recklinghausen (10-2) in their last game. Despite his very good performance the second-placed Recklinghausen (10-2) lost 70-83 at home to the much lower-ranked (#9) Hagen-Haspe in the West group. 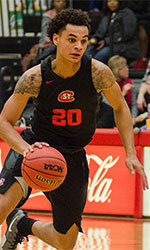 Turner had a double-double by scoring 18 points and getting 12 rebounds. He also added and 3 steals in 29 minutes. Turner has relatively good stats this year 11.7ppg, 7.9rpg and 1.5apg in 19 games. #6. Magne Fivelstad (6'6''-G-89, graduated '14, currently in Norway), who plays in the Norwegian BLNO was not able to help Fyllingen BBK (11-12) in their last game on Sunday. Despite his very good performance Fyllingen BBK was defeated 101-89 on their home court in Fyllingen by the lower-ranked Tromso (#6). 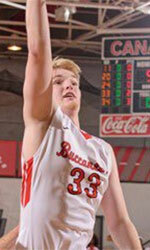 Fivelstad recorded a double-double by scoring 24 points and getting 12 rebounds. He also added 4 assists. This season Fivelstad has very high stats. He averages 20.4ppg, 12.3rpg and 3.9apg. #7. Kyle Carey (6'6''-G-97, graduated '18, plays pro in United Kingdom) was not able to secure a victory for Barking Abbey Crusaders (10-0) in their last game. Despite Carey's very good performance the league leader Barking Abbey Crusaders was badly defeated 92-74 on the road by the lower-ranked (#4) Riders. He was the top scorer with 20 points. Carey also added 8 boards, passed 4 assists and added 3 steals in 28 minutes. It was his first game for Barking Abbey Crusaders this season. #8. Filip Toric (6'7''-F-89, graduated '13, plays in Croatia) contributed to an easy victory against the closely-ranked Djakovo 92-73 in the Croatian Prva Liga (second division) on Sunday night. Toric scored 9 points, grabbed 4 rebounds and dished 4 assists. This season Toric averages 6.0ppg, 5.0rpg and 3.0apg.